Wow doesn't even come close to how great this book is, not to mention that this is book one of a series. From the time I started reading I got sucked in and couldn't stop. Every time I ended a chapter I had to just get one more in before putting it down, which was very hard to do. Jessica Shirvington did an amazing job with this book, you feel for the main character, Violet so much and what she's going through. You connect with how mad she gets when she finds out that the only person that she'd ever connected with lied to her about what and who she really is. And you can't help but feel her connection with Lincoln. Throughout the book you feel how much they love one another and how protective he is of her. I also couldn't help feeling a bit of an attraction when Phoenix entered the picture. At times I was glad he was there with Vi, but knew that something was off with him. This story is unique and brings a new and unique perspective on the word, Angels. I'm super excited for the second installment to come out in September, I'm hooked. PS - Keep an eye out later next month as we're going to be interviewing Jessica Shirvington and she will also be guest posting on Just Us Girls, we're very excited! Disclosure: All opinions are my own. 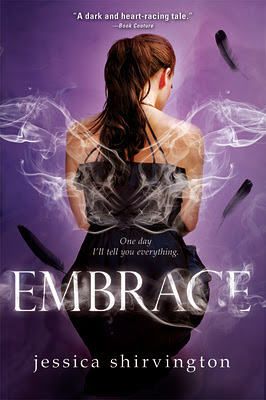 I received Embrace at no cost for the purpose of this review. No other compensation was received.